A French Quarter tradition since 1862, Cafe Du Monde beignets are probably the most famous beignets in the world. When you’re having beignets in New Orleans, you’re either eating them at Cafe Du Monde, or you wish you were. The traditional square doughnuts that were introduced to America in the 18th century are perfected at this famous French Quarter coffee shop, where a stack of beignets comes out freshly made and perfectly warm, often paired up with a hot cup of coffee and chicory cafe au lait. Sure, underneath all that powdered sugar is just a simple dough recipe, but how you put these 8 common dough ingredients together is what determines if your beignets are delicious, puffy clones of Cafe Du Monde beignets, or just boring fried squares of dough. First, dissolve your yeast in the warm water and sugar solution. Let it rest for 12 to 15 minutes and it should look foamy like this. If it doesn’t, check the expiration date on your yeast. If the yeast is new, your water was probably too hot, and you get to do step #1 again with less hot H2O. Once the yeast has bloomed nicely, whisk in the egg, milk, salt and half of the flour. Stir it just until everything is mixed together, and no more than that. You may notice that I’m using whole milk there, not evaporated milk. If you’re at all familiar with beignets, you probably know that most beignet recipes, including Cafe Du Monde copycats, call for evaporated milk. Evaporated milk is milk that has 60% of the water removed before it gets canned, which gives it a more intense flavor than whole milk, but it still tastes canned. I think whole milk tastes much better, which is one good reason to use it here, but there’s more than that to consider. In this screen grab, shot through the glass at Cafe Du Monde as beignets were being prepared, you can see several gallons of whole milk sitting on a counter near the dough mixing bowl. Sitting cold milk out to come to room temperature is exactly what you would want do before adding it to dough that needs to stay warm, so I think there’s a pretty good chance this whole milk is destined for the dough. Conclusion: the original recipe contains whole milk, not evaporated, so that’s what we’ll use. After you mixed all that up, stir in the melted shortening. Don’t overdo it though. Just a light stir is good enough. Now add the rest of the flour. Get your mitts in there and help combine all of the ingredients so that you can take it out of the bowl for the next step. Knead the dough on a well-floured surface with the heels of your hands just until the dough is smooth with no lumps in it. Form the dough into a ball and place it in an oiled bowl, then cover it with a towel or plastic wrap. Now you can catch up on your shows, since the dough will need to rest for a couple hours, until it doubles in size. While the dough is resting you should start preparing your oil. Cafe Du Monde, and any other restaurant that makes traditional beignets, will use cottonseed oil for frying because of its neutral taste. For decades, cottonseed oil was the only plant oil used for cooking in the U.S., until soybean oil took over in the 40’s following World War II cotton shortages. You can certainly use other oils for frying your beignets, but cottonseed oil is a must if you want the best hack. And you’ll want to get it to the exact temperature Cafe Du Monde uses: 370 degrees F. If frying in a pan on your stovetop, use a thermometer. Or you can use a deep fryer, which regulates the temp better. Your dough is rested and now it’s time to roll it out. Use a rolling pin to roll out the dough on a well-floured surface until it’s about 1/4-inch thick. Use a pizza wheel, or a sharp knife, to slice the dough into 2 1/2-inch squares. Drop the dough squares into the hot cottonseed oil and spoon oil over the top of each of them. Continue to baste for about 45 seconds then flip them over and repeat the basting. After another 45 seconds or so, flip the beignets again, and continue to flip them as needed for a consistent golden brown color on both sides. The beignets will fry for about 3 minutes total time. Drain the biegnets on a wire rack or on a plate lined with some paper towels. 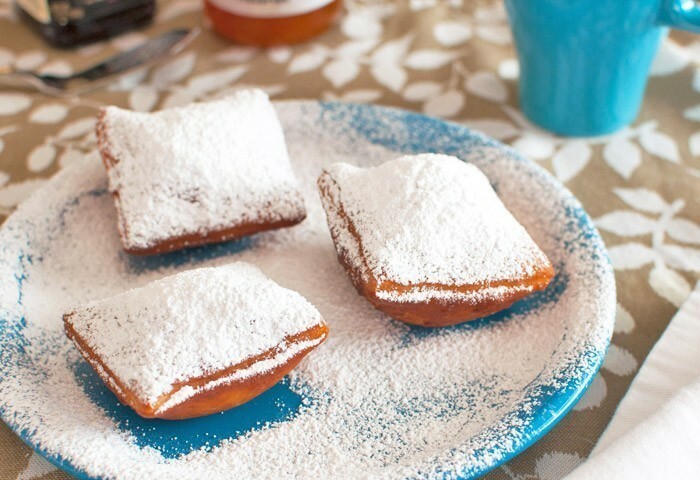 Finally, when the beignets have drained, place three on a plate, hit them with a snowstorm of powdered sugar, and immediately serve while warm. Whisk in the milk, egg and salt. Then mix in half of the flour with a large spoon. If using a mixer, use a paddle attachment on low to medium speed. Add the remaining flour and mix with the spoon until you can use your hands, then turn the dough out onto a floured board and knead just until smooth. Don't over-knead or the dough will get too tough. If using as mixer, swap out the paddle for your dough hook and knead just until the dough is smooth. On a heavily floured surface, roll out the dough until it is 1/4-inch thick. Use a pizza slicer or knife to cut the dough into 2 1/2-inch square pieces and fry 3 to 4 pieces at a time in the oil. Immediately after dropping the dough into the oil use a large spoon to gently splash hot oil over the top of each piece. after 30 to 45 seconds, flip all of the beignets over and continue to baste with the oil. After another minute or so, flip the beignets again, and continue to cook until the beignets are a deep golden brown. Continue flipping the beignets over to brown them evenly on both sides. After about 3 minutes, they should be done. Let them drain on a cooling rack or a paper towel-lined plate for a minute, until you can handle them. I made these last weekend and they came out perfect thanks to your instructions! I even made a raspberry sauce to go with them so I could feel like I really was in NOLA. I couldn’t find cottonseed oil so I subbed peanut, and next time I think I’ll make them bigger for fun 🙂 You don’t know how excited I was to find this recipe because I was so sick of the disappointment at restaurants claiming to have Beignets. Thank you Shannon. Comments like yours are why I love doing what I do. When my daughter hit me with “I need beignets this morning for my French Class Mardi Gras party” I panicked because I was out of my Cafe du Monde mix. 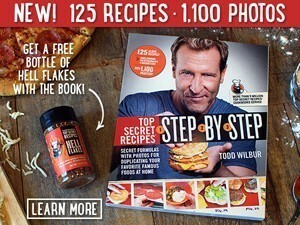 I found your recipe and will never buy the mix again. It came together so easily and they fried up beautifully. They were delish and a huge hit! I have been to Cafe du Monde and spoken to them about whether or not their recipe includes eggs because my son is very allergic to eggs (even a small amount cooked with other ingredients). I was told by the staff at Cafe du Monde that there are no eggs in their dough. There are also no eggs in the beignet mix that they sell at Cafe du Monde (in the mix itself or added during preparation). I’m sure that these beignets are wonderful, but the original Cafe du Monde recipe includes no eggs. Would the original recipe have used vegetable shortening? I have some homemade lard I was hoping to use. Do you suppose that would negatively affect the texture by not coating glutens the way veg. shortening does? My lard is quite soft/semi-liquid at room temperature. I’m not really a baker/confectioner, so this is all alchemy to me. Thanks for any insight. I’m not sure if you would detect any difference. Best way to find out is to try it. Let us know here how they turned out. Can you store the uncooked sliced dough overnight or freezer them to fry later? I haven’t tried the recipe yet. But can’t wait to try it out!! That should work as long as you fully defrost before frying. You can also par-fry the dough, freeze, and finish frying later. I grew up in Louisiana and have had Cafe du Monde many times. Now that I live in California, I missed beignes very much. This recipe was delicious and spot on. I decided to attempt this the night before and was not able to find cottonseed oil in the local stores. I used canola instead, which was fine. I think the next time that I make it, I will make sure to order cottonseed oil in advance. The ones I made were a bit smaller than 2 1/2 inch squares, and I think making them bigger (perhaps even as large as 3 inch squares) would definitely be closer to the original. The platter I made was empty in less than 5 minutes., and my guests gave me rave reviews. I should have made two batches, lol. Thank you so much for posting this recipe!!! Todd I am impressed! These are Fluffy, Puffy, Sugar Love Coated! Squares of Dough Goodness !YESSSSS! Beignet Heaven! I just have to travel by feet to my kitchen! Thanks again Todd for this hack! Wow! Yummy! What can I use instead of the shortening for this recipe? Margarine should work the same. Can I “fry” these in my air fryer? Help a vegan out here! What can I use instead of the egg? Sure. Measure the same amount. Your rise time will be a little quicker (by 15 minutes or so). What do you think will happen if I use butter instead of shortening? If you’re making this for the morning, is there harm in letting it rise overnight? You can do that. Cover it and let it rise overnight in your fridge, then bring it out in the morning to warm up 1-2 hours before rolling.